Ordering kiosks are an excellent way to boost your business while improving the customer experience. Even if customers come to your establishment because they like what your offer, they will always be receptive to your quality of service: fluidity, speed, efficiency… This are the “ingredients” they are looking for in a fast food restaurant. To improve this customer experience, you have to be attentive to how you manage your checkouts and queues, and this is where the ordering kiosk steps in. Ordering kiosks offer a number of advantages both for customers and for the restaurant. Shorter queue times: customers are dispersed into two categories; those who use the kiosks, and those who use the checkouts. Access to all services: customers can browse the menu, place an order, and also see photos of dishes and gain access to offers. Taking the time to choose: customers can browse the menu as they like. It’s no secret: customers spend more when they have more time to order. Offering a service that your customers will appreciate. Today, everyone (or nearly everyone) is familiar with using interactive kiosks: in restaurants (e.g. McDonalds), in train stations to buy tickets, in cinemas to buy or collect tickets purchased online… It’s now commonplace! 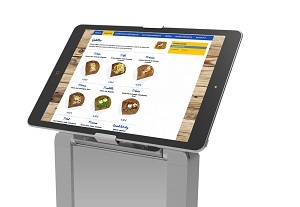 The ordering kiosk improves the restaurant’s internal organization and increases productivity. This relieves employees of certain tasks, allowing them to focus on others to deliver a better standard of work. Kiosks increase the restaurant’s reception capacity by allowing more customers to order in a shorter time. They offer the same services as your online ordering site, and help to increase the average basket via upselling, special offers, etc. The transition to the ordering kiosk will be very smooth if you already use a LivePepper ordering site. The idea is to offer the same service as the online ordering service, but in-store, i.e. on your restaurant’s premises. On a technical level, the ordering kiosk can use the same online ordering solution as your website: same design, same graphic charter to reflect your restaurant’s image, same architecture, etc. If you don’t yet have an online ordering site, you could even consider adopting a two-in-one solution: an online ordering site and an ordering kiosk. Whether the kiosk is large or small, you will need some means of support to securely fix it in a space that will not hinder customer traffic, usually near to the entrance and in front of the checkouts. You can even envisage installing your ordering kiosk on the premises of a large nearby company to extend your presence beyond your establishment. 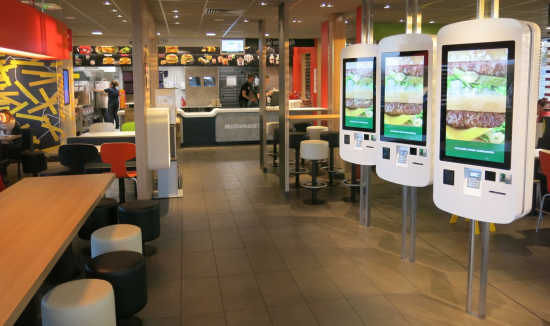 Installing ordering kiosks in your restaurant does not mean that your establishment will do away with its employees. The kiosk is first and foremost a means of improving the customer experience of those who prefer not to queue, and who would like to be able to sit down and do something else while you prepare their order. Moreover, even if some restaurants are going down the fully automated path, it is best to maintain the twofold ordering kiosk – checkout system, simply because some customers don’t like having to interface with a machine. Opening ordering kiosks at peak or busy times to ease pressure on the checkouts. Providing both ordering kiosks and checkouts. Closing the checkouts and relying solely on the ordering kiosks, placing smiling, hospitable employees at the customers’ disposal to help them with their orders (this third scenario is rarely used in the restaurant industry).